So lately I have had a really hard time coming back to the blog but today I decided to take advantage of a few minutes I had and tell you about my current infatuation with earrings. I have no idea where it came from but now that I am thinking about it, I guess its crazy for me to see how over time earrings just drew me in more and more. Today I guess i am just a little more obsessed with them, a lot more than I ever thought I would be. I really want to add more piercings and maybe this month I get the chance to actually do it. I currently have two piercings on my ears and just up to recent years I never liked changing my earrings. I simply preferred to wear tiny ones that I thought would go with everything and I would never have to take off but right now I am so into doing something like the picture below. But I am also so into wearing big and small earrings and changing them all the time. I guess we can say that I learn to have more fun with these accessories. I have been saving a bunch on Pinterest as well as just going online to order some. I really thought I should share some since I am really into them but I didn’t realize how into them I was until I started wanting to shop online for them. I am in LOVE! I went crazy and saved sooo many of them, I am having a really hard time choosing but her are s lot of them. I don’t wear statement earrings very often but I am so attracted to them. Sometimes I hold back on wearing them because they are too heavy and I have long days or they will stand out too much (which is the whole point right) but they just are not right for the particular activity I am doing even though they go with my outfit. Okay okay these are all excuses, it’s time to start earring them period. I have to admit some of the ones I am showing to you are to pricy for me but they are so so pretty, I had to show you. HOOP EARRINGS- They are currently my favorite to wear. Why? I have no idea, they just are. I am sure you have noticed, I think I lately I either wear hoop earrings or I don’t wear any. 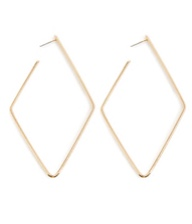 I tend to wear the classic hoop in different sizes but I have been wanting to incorporate different shapes. I love the the star ones above as well as the pearl ones, and I want to try some heart ones. Me wanting to wear hoop earrings and try different shapes is definitely something completely out of the ordinary. I guess I decided to embrace change and creativity, and hoop earrings are one way of me doing that. Dangle, thread, drop earrings or however you call these are something new to me; well maybe not the drop ones but the thread ones - I am just fascinated with them. The drop earrings I am sharing with you above are some really like, I think I would wear three of them on a regular basis. 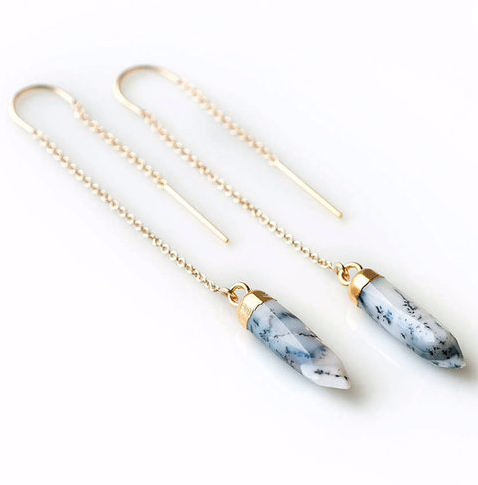 The other one (Keegan Drop Earrings) of them I like for special occasions or when I am wearing something white. But let’s talk about the Thread Earrings; I want them all and I can’t decide which one is my favorite.One thing about the threaders I shared above is that the Minimalist Stone Drop Threaders are offered in different type of stones that help cleanse your energy and purify it like the amethyst one; I am eyeing that one. the other ones are super cool in my opinion because I feel like they are different and well I have never worn of these. Ear cuffs- I had no clue they existed until I came across first picture I showed you above. After that I feel like I have been living under a rock, but I like the way they look and what I like more about them is that you do not have to get a piercing!!! 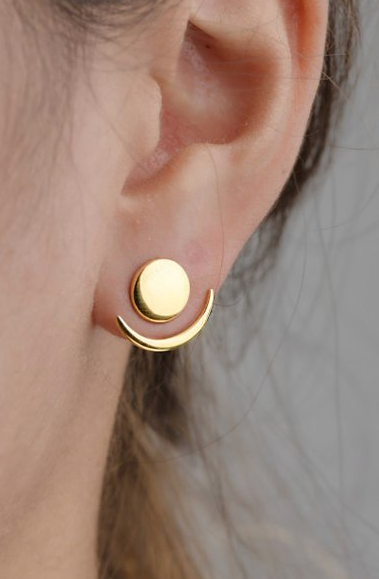 I am a cry baby when it comes to needles and if I can avoid them I will so these cuff earrings are going to make it in my list with out a doubt. Small earrings have always been my go to. I used to only wear a white rhinestone but I want to change it up and I love finding different shapes now. 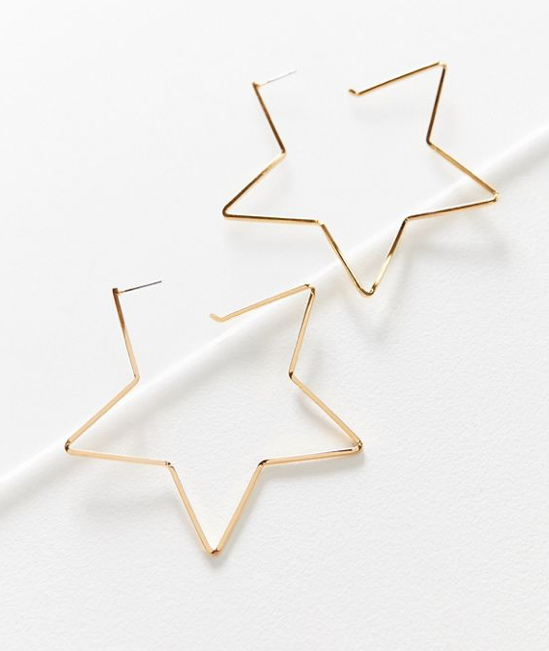 I tried sharing earrings from different price points and different stores but ultimately only earrings I absolutely loved. We each have our go to stores and I know lots of the earrings I shared are from big stores but I always try to make sure to support small businesses because I come from a long line of family owned small businesses and I know how hard it can be. This time I made sure I shared some from etsy. I guess I am sharing this because I want to shine some light on small businesses and bring awareness to you if you can shop and support small and local businesses do it! These people work so hard to make it and support themselves and their families, and doesn’t hurt to try to support them once in a while the way we support big brands with prestige and a large following.